Ms. Migum Gweon, in a lecture on self-acceptance, available here. Migum Gweon is a licensed marriage and family therapist, and she joined Fuller in September 2014 as the director of clinical training for the Department of Marriage and Family Therapy. She coordinates all things related to the student practicum experience and is passionate about training and equipping MFT students. She has a diverse clinical training background, having worked at a DMH-contracted agency, at a community mental health agency, in church and school-based settings, and in private practice. Gweon also has unique skill sets gained in previous careers, bringing with her years of investment banking experience, college ministry experience (InterVarsity Christian Fellowship), church ministry experience (including immigrant Korean churches), and classical piano training. 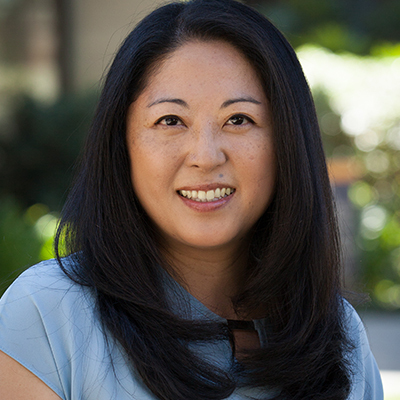 Gweon has a private practice in Pasadena and has special interests in intergenerational family dynamics and immigrant cultural issues, as well as divorce care, interracial marriages, and blended families. She is a clinical member of the California Association of Marriage and Family Therapists (CAMFT) and the American Association for Marriage and Family Therapy (AAMFT). Download Migum Gweon’s CV, which includes a list of her current publications, here.